This piece was published in the 2015 issue of Mayborn magazine, the magazine of UNT's Mayborn School of Journalism. It is about writer Helen Thorpe and her path to becoming a successful journalist, public figure and mother, and tells about how she finds her stories and goes about writing them. I traveled to Colorado to spend time with Helen, and wrote this profile over the course of three months. 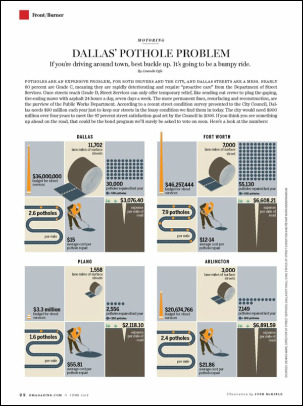 This is a piece for D Magazine's June 2015 issue where I researched Dallas' pothole dilemma compared to other neighboring major cities in the area. The image to the left is what appeared in print. Click on the photo for the web version. This is a feature story that was published by the Denton Record Chronicle about an area of Denton known to locals as "Cement City." 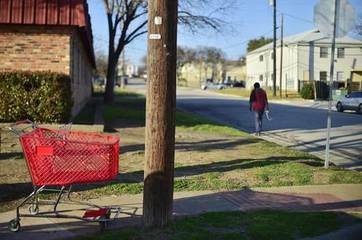 Located directly across from UNT, the area has a history of crime and poverty. And with no public housing in Denton, the area exudes a feeling of being trapped with nowhere else to turn. 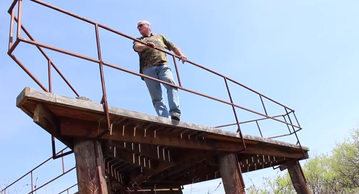 This is a long-form narrative about a Brazos River ranch owner experiencing the effects of the drought. 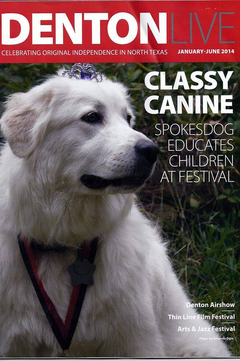 This story was written for Denton Live magazine and features Solaris, the 2014 Spokesdog for the Dog Days of Denton Festival.